You should all know I adore Soap & Glory by now! My parents bought me a few of their products for Christmas, including some make-up. I've actually got two of these mascaras so I needed to go on a break with my Revlon and give this a chance. The mascara claims to create longer, fuller, fabulous lashes. It features SUPERFILL Lash Fillers, SHINE AMPLIFIERS, NOFLAKE24 technology and wax film formers. 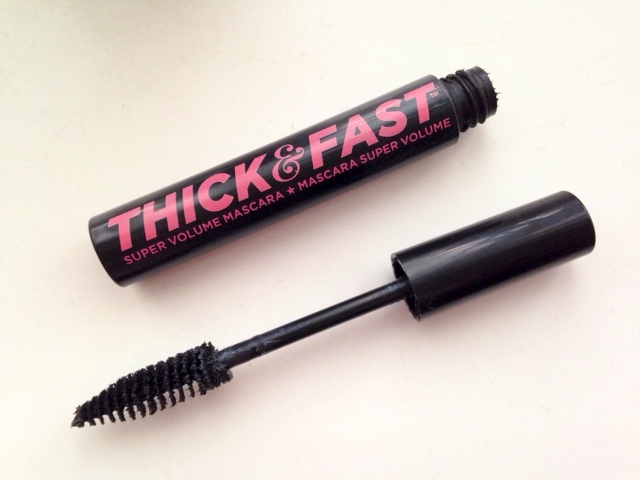 We can all agree that this Soap & Glory Thick & Fast mascara is really going for the voluminous lashes crowd. If you want to see it in action then take a look at my main image on the side of this post or on my New Year's Eve post. I couldn't think of another con to make it even so this definitely gets the thumbs up for me! It retails at £10 but you can get it in different Soap & Glory sets inc. the Girl-O-Whirl or Yule Monty. Have you tried Thick & Fast? Let me know your thoughts in the comments! I've not tried any Soap and Glory Make up before -in fact I haven't tried anything other than bath products! I need to have a little look, I'm always hearing great things about their cosmetics. I've started using this too and I've found it a little bit disappointing...but am willing to see if it grows on me! I DO like it lots though, definitely better than a lot of mascaras I've used in the past. Thank you I've been searching for a new mascara lately!